Divi Wordpress Theme Review – It is Worth all the Hype? Divi WordPress Theme Review – Why it is worth all the hype? Divi WordPress theme is one of the few real multi-purpose premium WordPress themes developed by Elegant Themes. It certainly combines amazing looks with a plethora of outstanding features to deliver a profoundly resourceful theme. An easy to use drag and drop page builder and a wide variety of page templates will be an ideal option for both those seeking an extraordinary solution, and those who are looking to build custom designs without having to write a code. 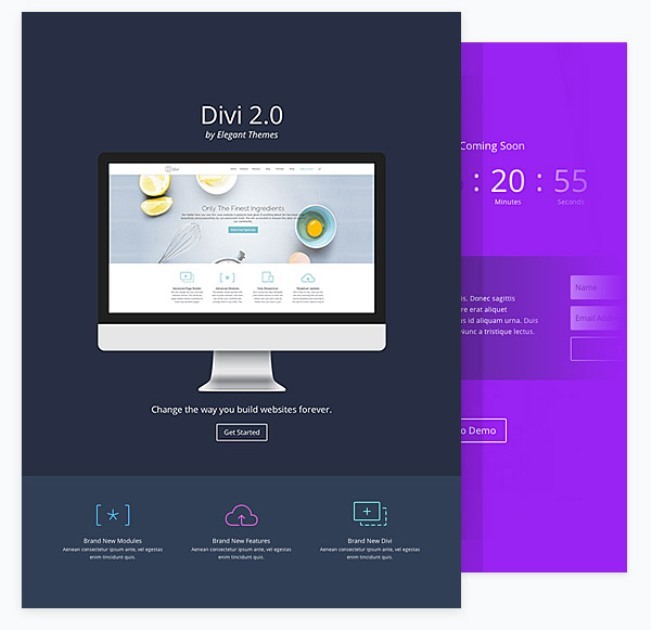 Divi is comparatively of young age, launched in 2013 now with the latest version 2.5.3. Since its inception, it has managed to receive a lot of attention from WordPress users, thanks to its advanced Divi page builder, a variety of other features and beautiful looks. As already mentioned, Divi is a great and powerful WordPress theme offered, it brings together all the essential options and features in one place which one might need to build a successful site using WordPress. Though a lot of design options persuade you into thinking it is only for experts, it is entirely beginner-friendly. It allows anyone to create great looking sites without having to mess with the coding part. Elegant Themes is one of the oldest premium theme service providers that now has a huge collection of themes and plugins. The launch of Divi, their most advanced and aesthetically appealing theme, has once more made it a strong competitor in the global marketplace. Simply looking at the demo of the theme, you can figure out how brilliantly it has been designed and integrated with many popular elements of the most advanced WordPress themes. These features consist of full-length one-page layouts, a responsive design, attractive icons, large sliders, full-width layouts and so much more. Divi theme is also incorporated with WooCommerce plugin to enable users to build a WordPress e-commerce Website. Also, the theme has a wide range of prebuilt layouts for those who are looking to create an online store. Divi theme can be used for a number of purposes ranging from multiple blog layouts, a range of portfolio types, a business site, a creative agency, creating a landing page and a whole lot more, thanks to different layouts equipped with this theme. Undoubtedly, the appearance and design of Divi theme are absolutely impressive and the look is flexible enough to be shaped into any kind of site. However, the appearance and visual design of this theme is not the only amazing feature to highlight. Just like others, Divi also comes with an elegant, standard options control panel to help you customize the settings of the theme. This e-panel is divided into various sections such as General settings, navigation, layout settings, ad management, SEO, Integration and Support docs. These options enable you to configure the basic appearance of your website. From theme options panel, you can control some pretty important sections relevant to your site. Best of all, it also allows you to customize the inbuilt elements too using Divi → Module Customizer. Clicking on this page, you can get access to all the elements integrated into the theme. With Divi e-panel and module customizer, the process is made extremely convenient for those who want to create their own sites but aren’t enough technically sound to do so. Who should use Divi WordPress theme? Divi is a powerful WordPress theme, and due to its versatility and flexible structure, can be used to build almost any type of website. In fact, the sales copy of Divi theme says “it is the only theme you ever need.” It is extremely useful for both WordPress beginners who are looking to build quality DIY websites, up to highly skilled experts who create sites for their clients and want to accelerate the development process. The key feature of this amazing Theme i.e. inbuilt drag and drop page builder enables web designers and developers to build web pages without writing a single line of code. Also, Divi not only helps designers and developers but also marketing agencies who need a robust and flexible base to get started. How quickly can you build a professional site with Divi WordPress theme? Divi theme has certain amazing features that will allow you to get your site the way you want it and also help you do a few things that you haven’t even imagined. To enable you to create pages and custom layouts, the theme employs a three-level hierarchical process. The process includes sections, rows, and modules. 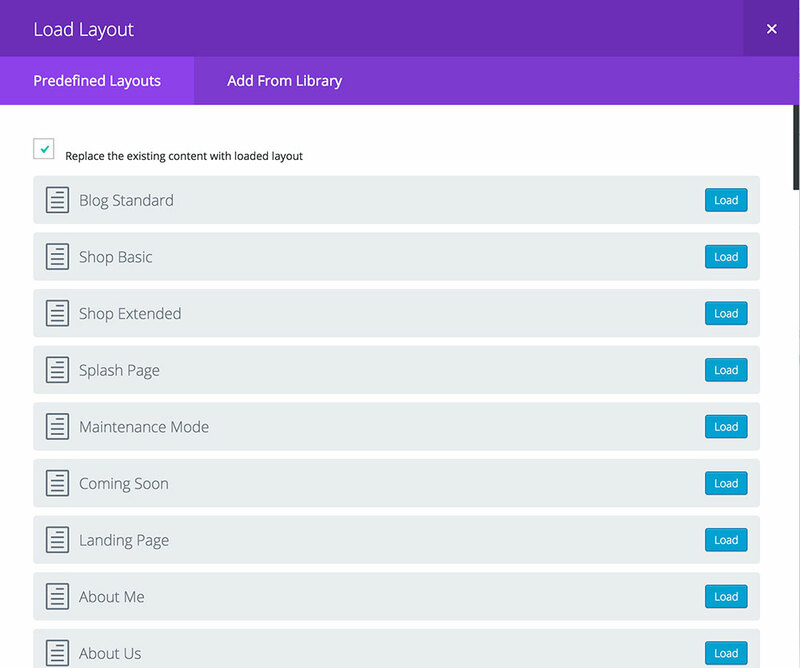 The ultimate selling point of Divi theme is its drag and drop page builder, which can be easily accessed from the standard WP page and post editor through a new button that Divi adds. The latest release has made it possible for the theme to work with all post types. Open pages → add new, you will notice a new button named “page builder”. Upon clicking the button, it will change from the WordPress WYSIWYG editor to the Divi page builder and you will be presented with unlimited options to customize your page. You are given the option to choose from the 32 inbuilt layouts or build your own. However, the list of these pre-made layouts is quite substantial and it includes the appropriate page layouts for a variety of purposes. Considering the option to create your own layouts, it is rather convenient to use one of the pre-made layouts since you may, at first, find it quite difficult to create your own layout. The easier option would be to use an inbuilt layout and edit it as per your needs and requirements. As an instance, if you are looking to load the Homepage Shop Layout, the drag and drop tool will automatically load a complete illustration of an ideal e-store. Personally, I can say, after playing a little with drag and drop tool, that it’s quite easy to use once you get a hang of it. The tool takes you through the practice of designing your page by integrating full-width sections, adding modules, and rows and columns. In fact, in comparison to other page builders, with Divi drag and drop tool, you can’t go wrong. It might be bewildering when you are presented with a huge number of options, but if you stick with it for some time and keep using the inbuilt layouts, then using drag and drop tool to build a complex page should not be an exigent task. As a matter of fact, Divi page builder is designed for the non-technical users who want the right tool to give voice to their creative artistry when it comes to building an elegant, creative webpage. Page builder modules are the building blocks of Divi theme design. In fact, they are responsible for adding new feature and character to your site. 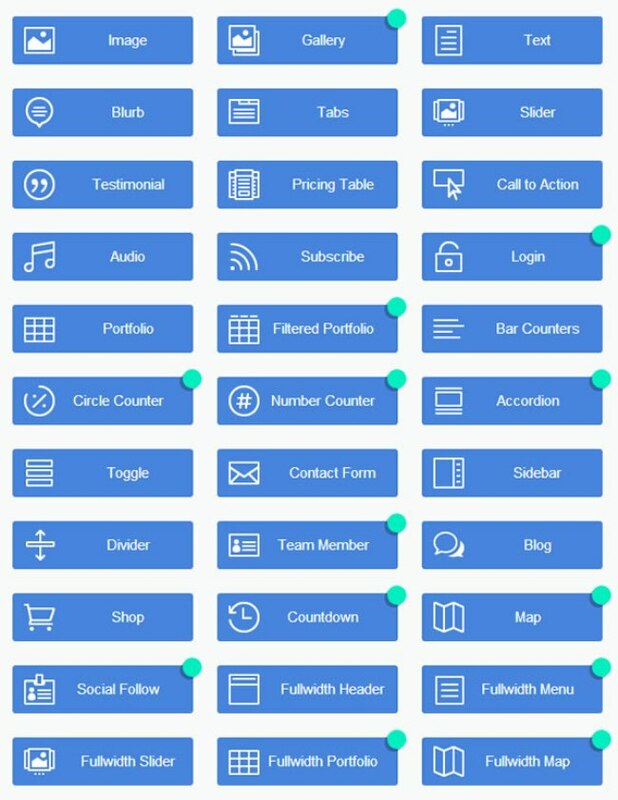 Divi page builder offers 32 modules to choose from. 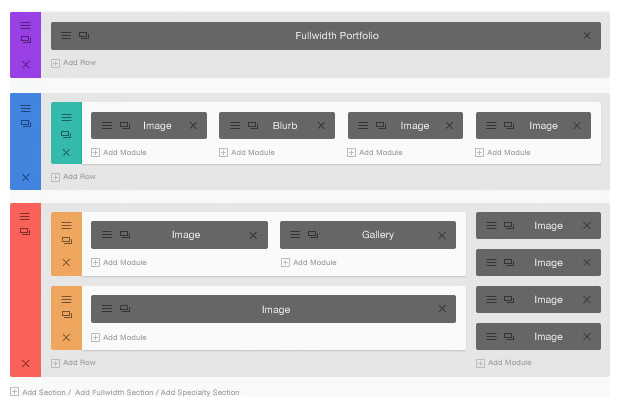 Modules are consist of different elements like sliders, newsletter signups, portfolios, pricing tables, text, and images. These modules are added after you have added a row which includes, at least, one column. Once you have added a particular module to your page, you can edit it by choosing its icon available on the page layout. Now you can customize this module to meet your requisites using the standard editor and the forms. During the whole web page building process, Divi drag and drop page builder never lets you edit any code no matter how complex your page may be. If one were asked to identify the ultimate selling point of this theme, Here are the options. Though it is extremely easy to use Divi page builder to build complex pages, it still comes with more than 20 pre-made layouts to help beginners get started. As already mentioned, you can also build your own layout and use it later. As the name suggests, Clone tool helps you clone any particular element of the website with the settings. It allows you to build multiple components in your website with common properties. Divi 2.0 allows you to build professional looking and unique landing pages. The theme comes with a blank page option, which removes the header and footer areas from a webpage. This enables you to build a landing page or even a “coming soon” webpage for your website. Divi 2.4 comes with a whole new library which allows you to store your layouts and other elements that you build for later use. It allows you to save modules, rows, sections and layouts. The theme gives you access to the library from within the drag and drop tool and lets you filter elements available in the library by category, type, and name. You can also customize any module or section within the library. A theme’s security is indeed of utmost significance. And developers at Elegant Themes take it extremely seriously to ensure that Divi offers solid and tight security with no errors and bugs. 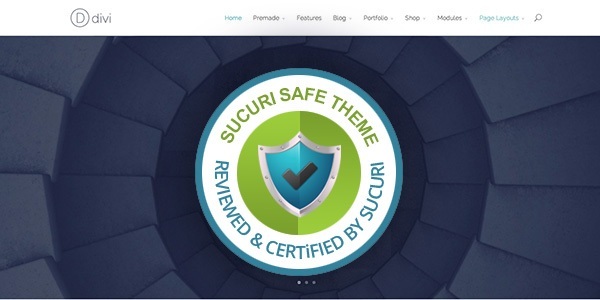 They have, in fact, partnered with Sucuri.net to ensure every elements and module is tighter in reference to security. 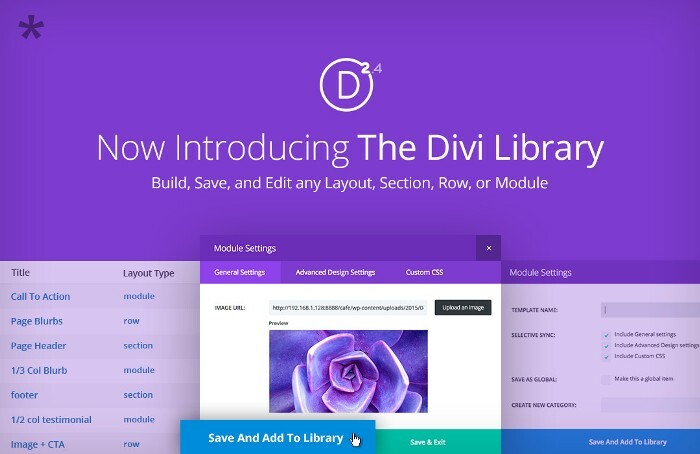 Divi theme has 32 inbuilt language translations to help a wider community of WordPress users to make the most of this open source software and the amazing design of the theme. Aside from being translatable, the theme also offers support for RTL. So, now your site does not have to be restricted to a particular audience or region. Divi has an assortment of tools at hand to build some outstanding websites. Here are some of the amazing sites that have been built with Divi theme as their base. The list of these sites is hand picked from across the internet to provide you with only great theme examples. Note: Some of the websites shared in this list have had substantial customization to the core functionality of the theme and thus, to get a similar look, you would need to make the same changes. Best Little Coffee Shops is an online travel guide that shares details about coffee shops they encountered while traveling the world. The site clearly states that it is not a review site, but instead a sharing website. The site features a beautiful logo of two coffee cups that shrinks as you scroll down. The website is a well-designed website with exceptional functionality made easy with Divi. Academy Of Mine is yet another great example of Divi theme that features a variety of webpages abreast with a blog. The website is basically an online courses site that allows e-learning business owners build, sell and market courses. The homepage of the site has 10 minutes and 53 seconds of a video in a tailored color backgrounds. City Hill Church is a site that is designed for the sincere. The website has used the layout options of the theme to manage different sections of the site in an interactive way. Though Divi is very popular for creating religious sites, it still has done a great job for City Hill Church website. Tampa Real Estate Insider, as the name suggests, is a real estate website that has different sections laid out accurately with a significant header that showcases the logo significantly. The search options and the contact details are kept to one side of the homepage to offer easily accessible search button. Breezway is the world leader in Louver Windows and showcases high performance and energy efficient Breezway Louvers. It features a beautiful revolution slider to show projects completed by the company. Breezeway has been designed in a variety of shades of blue and supports a video on the homepage. When you purchase Divi WordPress theme from Elegant Themes, you not only get access to Divi but also other themes and plugins offered by this theme provider. They do not charge you for every single theme or a plugin that you buy from them. In fact, they are well-recognized to offer 87 beautiful options for the price of one. You can choose from three different plans including Personal, Developer, and Lifetime Access. The personal plan gives you access to all 87 themes at just $69 per year. However, it is always recommended to choose Developer plan that costs $89 per year and offers access to all 87 themes and all plugins. Lifetime Access costs $249, which you have to pay only one time and gives you access to every theme and plugin they offer. Aside from the unbeatable price, they also have a no-questions-asked refund policy. If you are not satisfied with the services, you can always get your money back within 30 days of your purchase. Starting at just $69 per year, it works out approximately $1 for each theme which is an incredible deal. $69 is just half the price that the competitors of Elegant Themes charge for a single theme. Divi has won many hearts around the world with its amazing layouts and flexible structure. Here are few reviews shared by the users of Divi. The way Divi builds its amazing page layouts has been in controversy for a long time now. In technical terms, it uses shortcodes to build pages and as long as you are using Divi theme, these shortcodes will be converted to your desired layout. But that’s not all. Till the time Divi is your active theme, there isn’t any problem. However, if you ever decide to switch to another theme, be ready to see your content filled with shortcodes. And we are not talking about few shortcodes here and there, we are talking extensive shortcode pollution which makes your website look like a colossal waste. That being said, it’s not a huge problem that can’t be tackled. In fact, it can be a blessing in disguise especially for those webmasters who change their themes as they change their clothes. A website is what derives your business and help you deliver what you are offering to your audience. It is basically a face and identity of your business on the internet – and fundamentally you shouldn’t change the face of your business every so often to maintain the same trust and credibility of your audience. Yes, it is important to stay up-to-date with your website design, but it should be more of an evolutionary update instead of an exhaustive. Being tied to Divi theme can prove to be a good way to refine your site, than wasting time redesigning it every so often. And you will get more time to focus on your business and marketing strategies. Divi is a self-contained WordPress theme that lets you create almost any type of website. However, there are certain options that you can choose if you are not a huge fan of Divi. In this section, I have gathered few alternatives to Divi to help you choose an option that best suits your needs. Extra is a flexible, well-designed and modern WordPress theme developed by Elegant themes. The theme is also powered by Divi Drag and Drop Page Builder to make designing webpages a lot easier and convenient. Extra boasts of its solid framework and beautiful design. With Extra, every element of your website fits flawlessly to every screen size and device, thanks to its 100% fully responsive design layout. Convertible is a highly intuitive and incredibly powerful WordPress theme that is powered by Divi drag and drop page builder. Convertible is introduced to give classic sales page a new face. Since landing pages play a crucial role in digital marketing and help webmasters, who have only one product to sell, to build a page to reach the masses. Integrated with a page builder, the theme enables you to completely customize your sales page without having to write a single line of code. There are only a few WordPress themes that offer so much. Divi theme is one of them, thanks to its advanced drag and drop page builder integration. it is well-crafted and the use of all its components is quite intuitive. Another aspect that makes Divi a preferred choice is the team behind it. This team offers around-the-clock support services to help their clients build the best sites ever without any hassle. Also, it serves to the requisites of all possible niches. The drag and drop tool is an ally for webmasters especially those who do not have any design skills. But is it one theme that can rule all the others? Well, not quite yet! Well, this was my long Divi WordPress theme review. Have you tried this theme yet? Please do share your reviews and experiences below.